And it is another Donna Hay Challenge, and I write this post on a very last day. The recipe comes from the most recent Donna Hay magazine nr. 61. The photography is by William Meppem and Styling by Steve Pearce. You can find all the rules for the challenge on the Simone’s DHSPC page. So no story today, no complaining about peas that were not green enough. Just enjoy spring. This is perfect recipe for spring and busy days. You don’t need to do much and you have delicious, healthy snack. Cut the pastry into around 9-cm squares and score a 1-cm border around each square. Place the tomato, peas and mint in a medium bowl, drizzle with the olive oil and white balsamic and toss to combine. 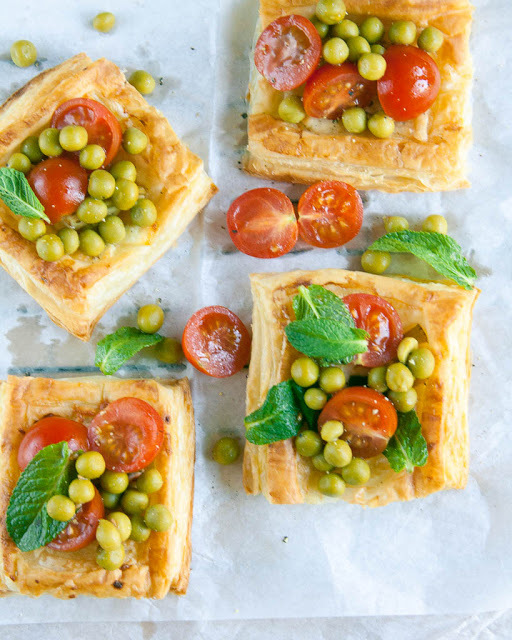 Posted in Savory tarts, Snacks and tagged artichokes, mint, peas, puff pastry, tarts, tomatoes. Bookmark the permalink. O haha, don’t we all have that problem that time just flies away from us? So happy you did manage to make it Magda and it looks pretty darn good! I do love this recipe and will definitely be making this again (and again and again)! Thanks for participating!